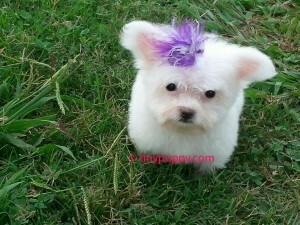 This is one of the smallest Maltese I have had. She is so tiny. Weighing in at 15 oz and 10 weeks old. Micro Mia will be available soon. Call me if you are interested in her. Estimated Adult weight just 2 – 2.5 lbs. So tiny for a Maltese. This is a once in a lifetime chance to own such a beautiful tiny baby. Her ears are up, but that is because she is so tiny. They should fall as her hair lengthens. She is just as cute as can be and look, NO Tear stains! $3500 Sold on my way to New Orleans! Micro Maltese Mia. Very tiny! 15 oz. @ 10 weeks!